An AIMS Power inverter runs Princeton’s ‘Power in a Box’ – a humanitarian effort by the university’s Engineering Projects in Community Service (EPICS) program – to help Bermuda Institute of Ocean Sciences (BIOS) this summer. The Princeton Power in a Box was awarded a $90,000 grant in Washington D.C. at the Environmental Protection Agency’s National Sustainable Design EXPO for the 2012-13 academic year. A renewable energy system is only as strong as the power inverter it uses. Princeton University students learned that concept early in the development of a portable wind and solar power system – “The Princeton Power in a Box” – which won a $90,000 grant at the Environmental Protection Agency’s P3 National Sustainable Design EXPO for the 2012-13 academic year. 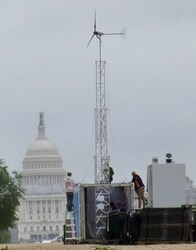 The Princeton Power in a Box is the first system to ever fuse solar and wind energy into one portable system. Built as a tool for disaster relief in the aftermath of an earthquake in 2010 that crippled the country of Haiti, it’s now in Bermuda helping BIOS power the Atlantis project. The hybrid electrical system can generate about three kilowatts per day all from a standard 20-foot shipping container (so it can be sent anywhere in the world). It uses a 40-foot retractable wind turbine that deploys through the ceiling of the container and solar panels that fold out from each side. An AIMS 5000 watt power inverter acts as the backbone of this system, transforming the DC electricity stored by the 24 volt battery bank into AC (alternating current) power that can be used to run computers and other technology used by Atlantis. Students had full control over which products they used for the Power in a Box, but Catherine Peters, professor of civil and environmental engineering, is an adviser to the EPICS team. The project has garnered plenty of attention from the locals of Bermuda, who wish to gain energy independence, as Li and her fellow students work to spread awareness of the effort. Li says she decided to be a part of the project because she believes it has the potential to make a global impact. AIMS has become a multimillion dollar company because of commitment to the inverter industry. Inverters will be sold worldwide regardless, but innovation combined with excellent customer service separates AIMS Power from the competition. Buying an inverter is almost never a cut-and-dry process so AIMS Power prides itself on being the most accessible company in the inverter industry when it comes to technical support and providing quality information to our customers via AIMS Power’s communication platforms. Inverter users call and e-mail AIMS Power’s technical support and customer service teams daily from all over the world with issues ranging from aftermarket boat upgrades to backup power systems during hurricane season, and they always reach a real person with a real commitment to solving their problem — no matter how big or small. To contact AIMS Corp, simply call (775)359-6703 or e-mail to sales(at)aimscorp(dot)net. Like us at Facebook.com/AIMSpowerInverters and follow us on Twitter @AIMSpower for more inverter information and AIMS Power promotions.